A Polar Bear is getting too close to civilization as he nears Camp Nanuq located along the Hudson Bay in Churchill, Manitoba. Patiently waiting for the Hudson Bay in Churchill, Manitoba to freeze and become cold enough for this polar bear to hunt ringed seals, he wanders across the tundra near Camp Nanuq to scrounge for food. The odors which emerge from the kitchen at Camp Nanuq are enough to capture the senses of this Polar Bear and peak his interest. 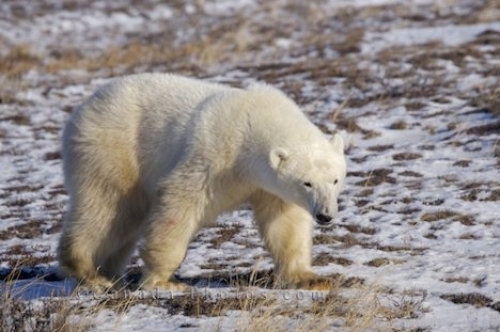 People in the towns around the Hudson Bay, especially near Camp Nanuq, are always aware that a Polar Bear can be within close proximity and cracker guns are used to deter them. Being the largest land carnivore in the world, the people at Camp Nanuq are aware that they should keep their distance from a Polar Bear and always treat them with respect. Picture of a Polar Bear making his way across the tundra along the Hudson Bay in Churchill, Manitoba where he nears Camp Nanuq. ... one that should not be reckoned with and most people who reside around Churchill, Manitoba know what steps to take if one appears around the towns or camps. Polar Bear, Ursus maritimus, near Camp Nanuq, Hudson Bay, Churchill, Manitoba, Canada.